Conan O'Brien got me through college. Whenever I stayed up late writing a term paper due the next day, I would watch Late Night With Conan O'Brien. It wasn't long before I became a fan. O'Brien is an incredibly talented performer and host, with a quick and sharp wit and an array of outrageous characters. In 2010, the world witnessed one the strangest, saddest, most bizarre and most idiotic debacles in television history. That year, Jay Leno, host of The Tonight Show, handed the reigns of the program to O'Brien, who left Late Night to take the hosting duties of this institution. In return, Leno would host The Jay Leno Show with O'Brien following him. This was done to keep both Leno and O'Brien at NBC, and both agreed to the arrangement. However, things quickly went disastrously wrong. The ratings for The Jay Leno Show were abysmal, and O'Brien was similarly struggling with his audience. O'Brien's brand of humor appealed to college-age/educated kids, but didn't play over well with the main audience of The Tonight Show: middle-aged couples. The higher-ups at NBC decided what was best to do was to move The Jay Leno Show to 11:35 p.m., forcing O'Brien to the past midnight, which was unprecedented for The Tonight Show. O'Brien and his fans were in an uproar over him getting pushed aside, and the situation soon became a public fiasco. In short, O'Brien agreed to leave The Tonight Show in exchange for a reported $45 million and to not be on television, radio, or Internet for six months after his final episode. Jay Leno got The Tonight Show back, and contrary to what O'Brien says, Coco got shafted. The ensuing scandal over the Leno/O'Brien brouhaha was poorly thought out, poorly executed, and poorly handled from beginning to end, making it one of the most notorious disasters in television history. All this is background information for Conan O'Brien Can't Stop, the Rodman Flender documentary chronicling the behind-the-scenes activities of O'Brien and his Late Night/Tonight Show staff and band's Legally Prohibited From Being Funny on Television Tour during O'Brien's forced exile from television. What we don't see is the actual Legally Prohibited Tour save for some clips, more often than not the closing song and dance O'Brien and his backup dancers do. Instead, Conan O'Brien Can't Stop is more about O'Brien's conflict of emotions while on the tour: outwardly frivolous but with a hard edge to his dealings with nearly everyone save his children. The film goes from the beginning of the Legally Prohibited Tour, where he and his writers start coming up with ideas for performances, right through the rigors of the road as he hits 44 stops in the U.S. and Canada to rapturous audiences. Along the way, he meets his many fans many times, and as the Legally Prohibited Tour goes on, O'Brien is starting to become more and more irritated by these meet-and-greets. I got the sense that after the Universal City, California shows, he wanted to go up to tour producer Jeff Ross and say,"I want to be alone". Indeed, the portrait of O'Brien in Conan O'Brien Can't Stop is of a man who keeps going because if he were to stop, he would die. The entire Legally Prohibited Tour is partly a way to meet the fans, although at various points O'Brien complains about having to 'perform' for others before the shows and shows irritation if not downright anger at having to meet more people, but it also shows O'Brien as someone who less can't stop than won't stop. The best example of the disconnect between what O'Brien says and what O'Brien does is near the end of the tour. He keeps bemoaning having no days off, but when the film points out that he has days off from the tour, where do find him? We find him at his Harvard 25th Reunion as part of their Talent Show. At another 'day off', he does a 'secret show' in Nashville at White Stripes frontman's Jack White's studio. Finally, after completing his set at the Bonnaroo Festival in Manchester, Tennessee, he finds he is booked into introducing the various musical acts, much to his displeasure, leading him to compare himself to of all people, Anne Frank. There is something wildly wrong with a multimillionaire, with passionate fans paying I imagine high prices to see him live, comparing himself to one of the most famous victims of the Holocaust. While watching this particular sequence, I was aghast at his comparison. Even his long-term assistant, used to his manner of being, was surprised, and said the same thing I was thinking, "You did not just compare yourself to Anne Frank". Regardless of how exhausted he was (and by the end, he must have been), or how frustrated he was (which again, he must have been), his situation is in no way close to anything the Franks or any other Holocaust victim/survivor endured. Again and again, O'Brien doth protests too much. He keeps talking about how he doesn't want to introduce the acts at Bonnaroo, which he appears to have no idea who they are, but rather than say, 'thank you but I need to rest', he perhaps dutifully, perhaps gamely, does indeed, introduce the musical acts to a thrilled audience. Not that in this part, Conan O'Brien Can't Stop become unintentionally amusing. One can marvel how O'Brien and long-term sidekick Andy Richter appear to be puzzled over who the Bonnarro music performers actually are. While I figure they are aware of Tenacious D because of their associations with Kyle Gass and Jack Black), when they talk about Damian Marley and rap star Nas, both are at a loss as to who either are or what their music is. Richter tells his pal to just write "N-O-Z-Z" on his hand when he has to introduce him. In Conan O'Brien Can't Stop, the few times the film looks on Richter, he is the only one who appears to be enjoying himself. Judging from the footage, it's because Richter is the only one in the Legally Prohibited Tour who keeps his cool and goes with the flow. Unlike O'Brien, who understands that this show is a conduit to letting out his anger at his shabby treatment by NBC and to keep working, Richter appears in the film to be genuinely having a good time. 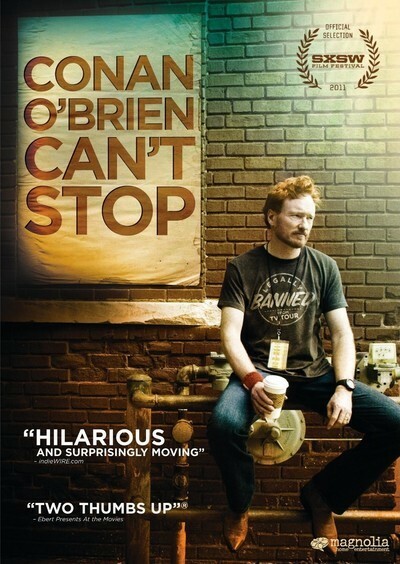 Conan O'Brien Can't Stop is a chronicle of a man in transition. While his outward persona is one of fun and frivolity, it really is a means of survival for the former Tonight Show host, who despite his protests still has an angry edge to the entire sordid episode. It is how he deals with others: his writers, his staff, and even at one point, his wife, not with cruelty or violence but with a humorous remark that can also be interpreted as a put-down. While watching Conan O'Brien Can't Stop, O'Brien at times appeared to be a man under siege, mostly from himself. There were one or two bizarre moments. One was in the Bonnarro section, when he appears to be doing his best to avoid comedienne Margaret Cho, who is barely seen and looks more like a slightly confused and whacked-out fan than a fellow performer. When he mocks 30 Rock star Jack McBrayer and at one point appears to 'quietly' ask him if he has any cocaine, I began to wonder two things: one, is O'Brien being deliberately mean to McBrayer and two, are they performing for the camera, which would then put a lie to the 'documentary' aspect and turn it into a 'mockumentary'. It doesn't help that if you don't watch 30 Rock, you may not know who Jack McBrayer is, or another guest star in the Los Angeles-area show: Jon Hamm from Mad Men. There are a few guests on the Legally Prohibited Tour, like Pearl Jam's Eddie Vedder, Stephen Colbert and Jon Stewart in New York, but what there isn't is a lot of the actual tour. Whether this is a minus depends on whether you would have preferred to have seen the Legally Prohibited From Being Funny on Television Tour or the behind-the-scenes of the tour. If the former, you'll be wildly disappointed. If the latter, well, you won't get much better. Conan O'Brien Can't Stop is a pretty accurate description of the man behind the Coco persona. For the most part, O'Brien appears to be a professional, if not perfectionist, entertainer who is grateful (most of the time) for his fans; he also is at times desperate to have others validate a sense of self-worth, one damaged by the mishandling of the Leno/O'Brien disaster. For hard-core O'Brien fans, it might come as a surprise that he can be anything less than the quick-witted nice guy but a highly-driven, almost possessed man. For those more interested in how surviving a major disaster can take a toll while still maintaining a sense of oneself, Conan O'Brien Can't Stop will show how behind the grin and wild red hair there is a slightly fearful, slightly but understandably angry individual. Questions about the film's veracity and a sometimes unflattering picture make Conan O'Brien Can't Stop a sometimes sad thing to watch. It is worth the time for his fans, but I don't see many new converts made through this film.